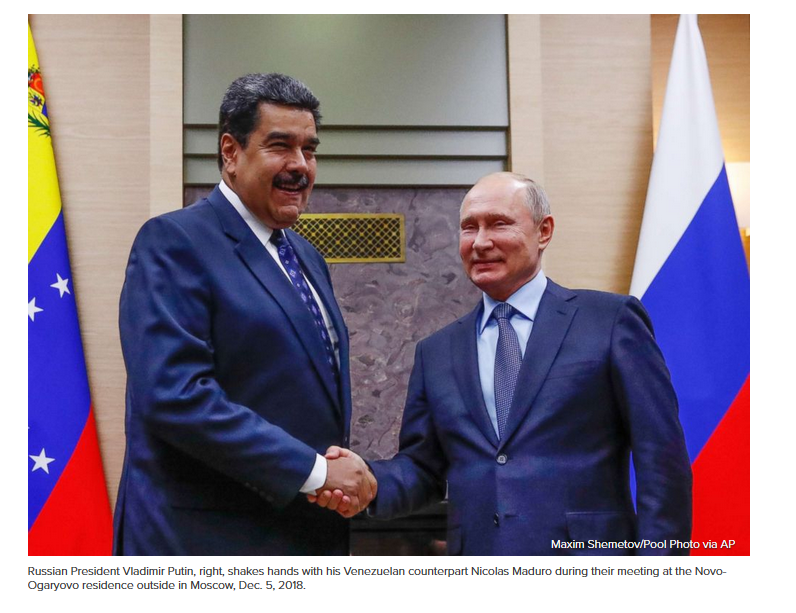 (ABCNews, Anastasia Bagaeva, 5.Dec.2018) — Venezuelan President Nicolas Maduro visited Moscow Wednesday for talks with Russian President Vladimir Putin. The Kremlin said assistance for Maduro’s regime was on the agenda. Maduro said at the start of the meeting that Venezuela had “gotten back on our feet” and praised Russia, according to Russian news agency Interfax. Russians expected to participate in Wednesday’s meetings include Deputy Prime Minister Yuri Borisov, Energy Minister Alexander Novak, Economic Development Minister Maxim Oreshkin and Igor Sechin, the CEO of Russian state-owned energy company Rosneft, according to Putin spokesman Dimitry Peskov.